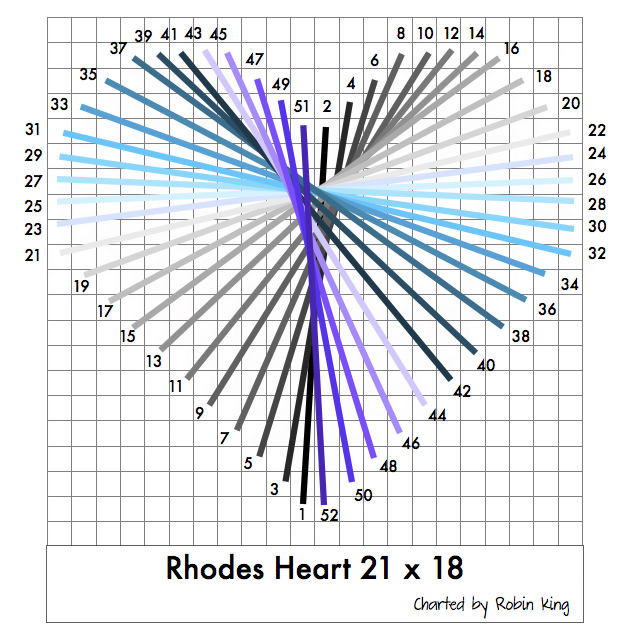 Today I was charting a Rhodes Heart to specifically fit the Heart design for a sweet little canvas, "To My Valentine" by Fiori (F-3639). 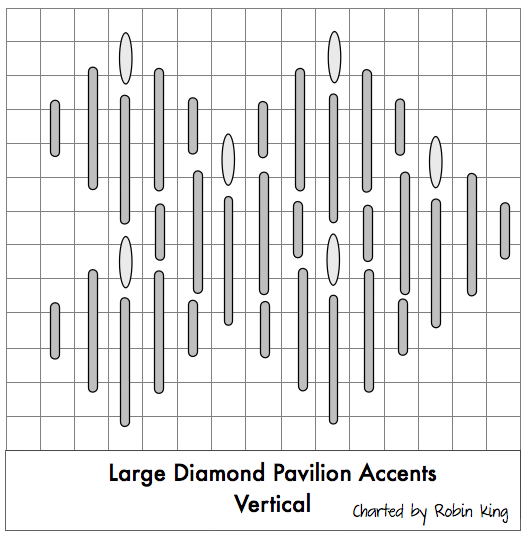 I enjoy charting stitch diagrams. I could have just provided my "generic" Rhodes Heart 8x8 and let the stitcher figure out the numbering sequence, but I wanted to do more. 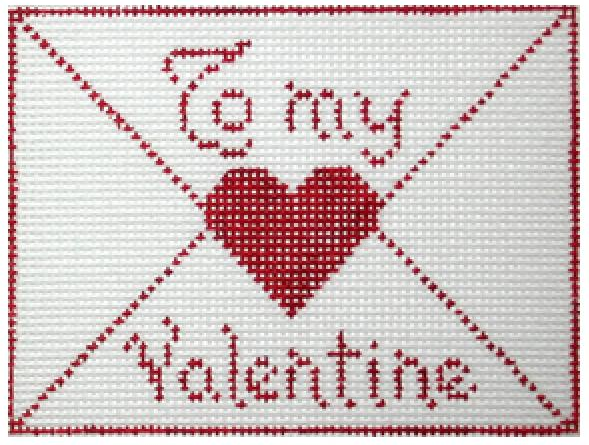 The Fiori Valentines Garland Club is offered thru The Nimble Needle-Atlanta. Stacy, the owner, did a great job selecting the stitches for the 5 canvases in the series. Each model is stitched to perfection. They are just the right size to be hung together in a garland... or imagine on a white wreath or white tree. Love! You can read more about the Fiori Valentines Garland Club on The Nimble Needle-Atlanta website. Today's Heart has these dimensions: 21 threads width and 18 threads height. 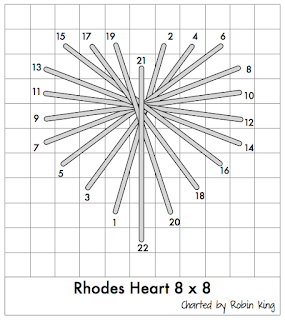 Working over the original diagram, I set up the grid. Then I started to lay the stitches onto the artwork in the computer... just as if I was stitching with needle and thread. I changed each stitch to a different color so I could see the progression. 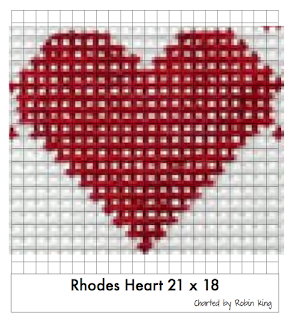 The last step was to remove the red Heart and to add the stitching sequence numbers. Voilà! 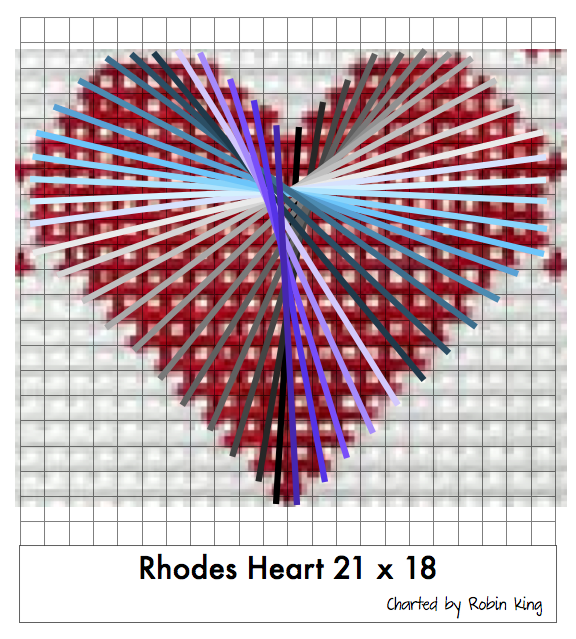 The Rhodes Heart 21x18 is complete; numbered and to scale. 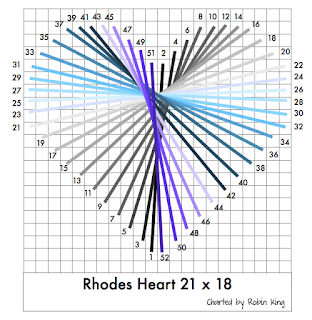 Try this on other Rhodes Hearts you might run across. Crayons, colored pencils, markers are fun to use if you aren't in front of the computer. So sorry to be so long for blogging. I've been crazy swamped: writing stitch guides for the next teaching destination. Just as soon as one event is over... 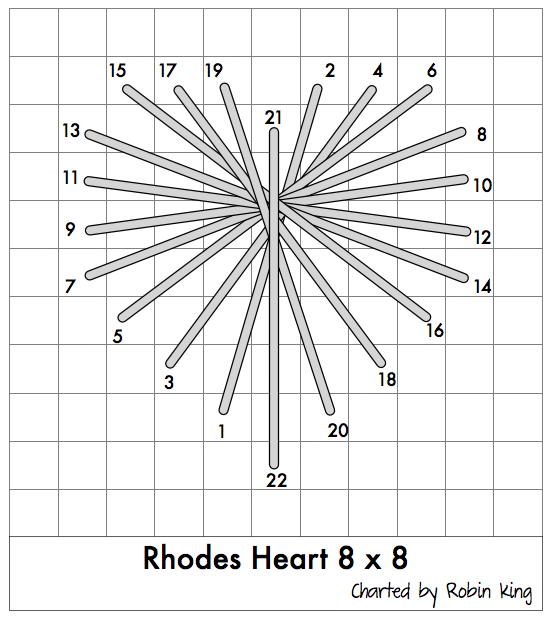 I have to rev-up the creative brain RPMs and do it all again. So. What brings me here now? at 1:19AM? 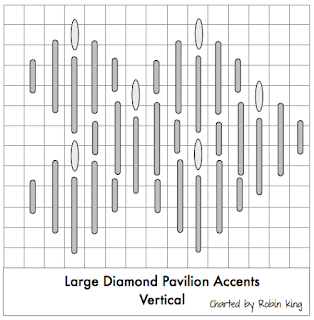 I finally updated the recent Stitch Guides page of those new 58 guides I've written in 2015. 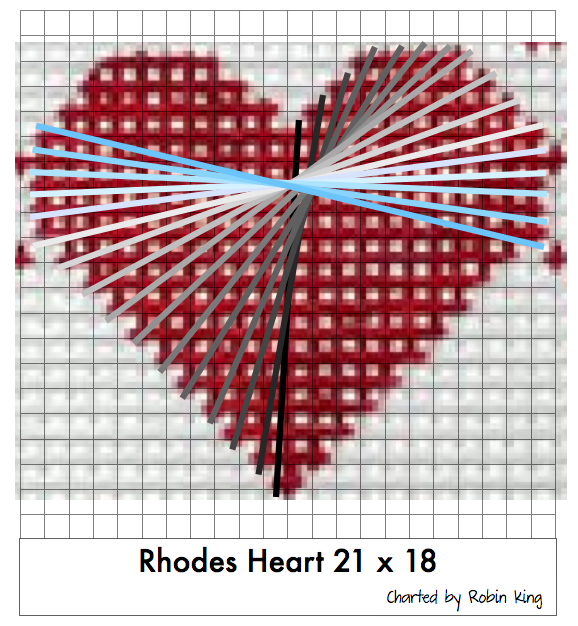 Click on the "Stitch Guides by Robin King" Tab and you can see all of the new ones listed as now available. Those which say coming soon! are for an upcoming event, and as soon as the event is over, those guides will be available, too. A lot of my weekly activity is posted on my Facebook page, but I realize not everyone is on Facebook. I really do need to do a better job blogging. Here's a stitch for you, too.